"Free-Light makes the highest quality solar lights for your yard. The Willow Solar Table Light is beautiful both during the day and the night. OMG Goodies is positive everyone will love this light. 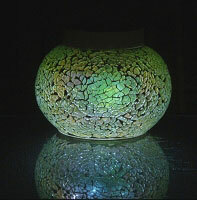 The Free-Light Willow Solar Table Light is hand-crafted by a glass artisan. The glass is absolutely beautiful day or night. It gently reflects light and sparkles as the sunlight touches it during the day. At night the light is a soft glow that adds the perfect amount of light to the space you choose to light. I have mine outside my front door on a table where it can gather west sun. It would be perfect on a patio table during an evening under the stars. The Free-Light Willow Solar Table Light has the solar panel on the top of the light and 5 LED lights shining down into the glass lamp. It comes with 3 rechargeable and replaceable AA batteries (Ni-Mh batteries). The glass is a shimmering green that makes it appear both bluish and yellowish at times instead of a solid flat green. It adds so much to the beauty. The glass isn’t solid, but small pieces grouted together. The grout adds to the shimmering effect as well. I cannot state enough how pleased I am with the design of the Free-Light Willow Solar Table Light. It is beautiful! Free-Light explicitly states their lights should be charged in direct sunlight. I suggest following those instructions – as the light will be provide a better glow. However, for this review, I went ahead and left it on my kitchen table for a few hours – with it switched to OFF (suggested for a quicker charge), to see what kind of charge is possible without optimal lighting. Just as stated by Free-Light, it charged and turned on – but not for long. I forgot to shut it off. The next night, at 2:30 AM, I walked downstairs in the dark to find a glowing Free-Light Willow Solar Table Light on my table. So, while this light is not intended for indoor use, and I highly suggest it charge outside, this was proof to me of the quality of the panels used. A low-quality panel will not charge in such poor conditions. I was very impressed; however, both my Free-Light Willow Solar Table Light and I am happier now that it brightens my front yard! I would recommend the Free-Light Willow Solar Table Light to anyone. It is a perfect gift for family or friend! With Free-Light Willow Solar Table Light everyone can have their very own night-time oasis!" Thank you Kameo! We appreciate every one of your kind words. Ready to read more reviews of free-light solar light products?